Learn more about events past, present and future at my blog, plus read random musings about writing and the outdoors. Join author David Leach at the Harbord House pub in Toronto for a reading, Q&A and launch party for Fatal Tide. The event will be on the second floor, at 150 Harbord St. (near Spadina & Bloor). Signing @ 7pm, Reading and Q&A at 7:30pm, festivities to follow. Talk about non-fiction book publishing to the Victoria Writers Society. Reading as part of B.C. Book and Magazine Week, Victoria, BC, time and location T.B.A. Book launch, reading, and reception at the University of Victoria Bookstore. Signing at 7:00pm, reading at 7:30pm, signing and reception at 8:00pm. Book reading and signing at Polar Peek Books in Fernie, BC, 7pm. Book reading and signing at Café Books in Canmore, Alberta, 5pm. "Who's Afraid of the Non-fiction Novel?" workshop at the Creative Non-fiction Collective Conference at the Banff Centre, 11:15am-12:30pm. Cabaret reading at the Creative Non-fiction Collective Conference at the Banff Centre, 7:30-9:30pm. Book reading and signing at McNally Robinson bookstore in Calgary, 7pm. 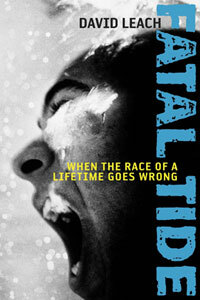 Fatal Tide will be released by Viking Canada. Pre-order it at Amazon or Indigo, or at my favourite independent bookstores, Munro's Books and Bolen's Books in Victoria, BC.